As credit unions continue to submit their 1Q 2017 call reports to the NCUA, Callahan is hard at work importing the first quarter data into our software analysis tools. As the credit union data trickles in, credit unions with impressive first quarter performances begin to emerge. 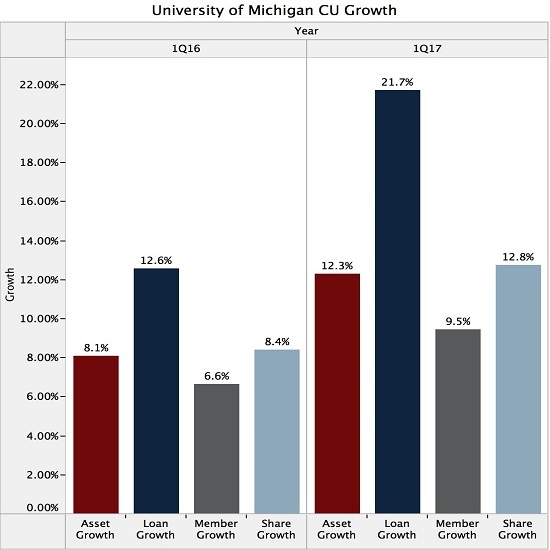 University of Michigan Credit Union (Ann Arbor, MI, $772.7M) is one of the leading first quarter performers in terms of year-over-year growth statistics. UMCU posted double digit asset (12.3%), loan (21.7%), and share growth (12.8%) with member growth coming in at 9.5%. Perhaps the credit union’s growth can be viewed as a return on investment from multiple projects and initiatives completed throughout the year. UMCU’s focus is to aMAIZE (University of Michigan’s colors are maize and blue) its members, community, and team by working together for shared success. 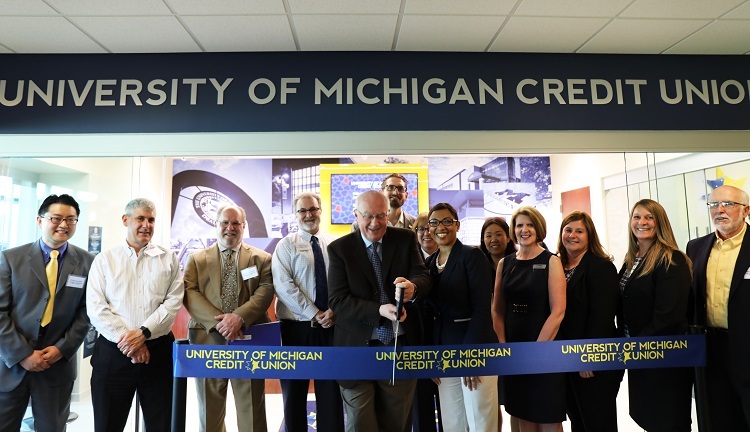 UMCU has expanded its branch footprint to 14 branches in Ann Arbor, Dearborn, Flint, and Ypsilanti; three of which are complete virtual branches, including one completed in the past year. Two existing traditional branches also were remodeled. UMCU’s virtual branches are equipped with the latest self-service technologies including contact center remote video conferencing and iPads to tend to each member’s financial needs more efficiently. The credit union installed the same cutting-edge features into the renovated locations in conjunction with spacious floorplans and sleek maize and blue furniture to capture the spirit of the surrounding community. Here, the credit union holds a ribbon cutting ceremony for the grand reopening of the newly remodeled Dearborn Branch. The branch improvements were coupled with product and service enhancements including an upgrade to MAIZEPAY (new online bill pay service) and new EMV chip credit cards to better protect members from fraud. UMCU has impacted its local communities through various initiatives over the year including supporting and hosting programs such as a chamber event, a Girl Scout cookie bake-off, and financial education workshops. The credit union also helped raise and donate money to the American Heart Association, raised more than $10,000 for and donated toys to the C.S. Mott Children’s Hospital, and donated $5,000 to Food Gatherers, which provided 15,000 meals to the local community. 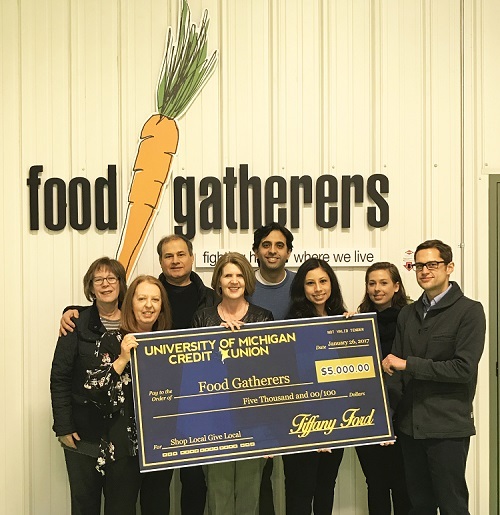 Here, the credit union makes a $5,000 donation to Food Gatherers. Pictured are Julie Wigley, vice president of marketing; Marian Perez, marketing manager; Max Bayram, marketing specialist; and representatives from Food Gathers. UMCU also forged two new partnerships with the University of Michigan: a financial education initiative and a sporting event partnership. The financial education initiative provides an eight-week financial education curriculum to more than 100 middle- and high-school students across southeast Michigan through the Wolverine Pathways program, while the sporting event partnership provides UMCU members with discounted ticket pricing to a variety of athletic events at the university. The sporting event partnership was established at an ideal time as the University of Michigan’s leading sport teams all had a relatively successful year. The football team and women’s basketball team both finished top 3 in the Big 10 Conference while the men’s basketball team made it to the Sweet 16 in the NCAA March Madness tournament. UMCU’s members can look forward to both rooting on their Wolverines next year and knowing their credit union is taking progressive measures to improve their financial well-being.